Residents look at an Army vehicle which was damaged during battle between Afghan security forces and Taliban in Farah province, Afghanistan May 16, 2018. REUTERS/Stringer NO RESALES. NO ARCHIVE. HERAT, Afghanistan (Reuters) - Taliban fighters with heavy weapons and night-vision equipment fought their way close to the center of the western city of Farah on Tuesday, as Afghan forces with U.S. air support battled to force them back, officials and residents said. 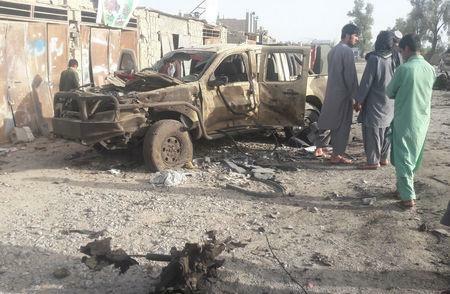 Residents of the city, capital of Farah province on the border with Iran, have warned for months the city was vulnerable and the attack threatened a repeat of the Taliban's capture of the northern city of Kunduz in 2015. Local people said Taliban forces began their attack at around 2.00 a.m. (2130 GMT Monday) from several directions and a senior official said the situation was serious early in the day as the insurgents overran several areas and the provincial governor left the city. However, as special forces units, backed by both Afghan and U.S. air strikes rushed to counter the assault, the situation stabilized later in the day. 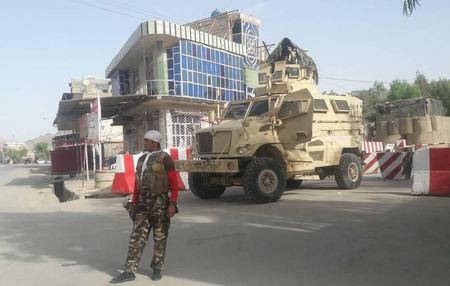 Mohammad Radmanish, a spokesman for the defense ministry in Kabul, said the insurgents had been pushed out of the city and reinforcements, including special forces units from neighboring provinces, had been ordered to Farah. The NATO-led Resolute Support mission in Kabul said U.S. A-10 attack aircraft were also supporting Afghan forces and there had been at least one drone strike, while Afghan air force A-29s and Mi-17 helicopters had conducted multiple attacks. "Farah city remains under government control, and the Afghan National Defense and Security Forces, supported by U.S. Forces-Afghanistan airpower, are on the offensive against the Taliban," spokesman Lt. Col. Martin O'Donnell said. However the speed of the attack, which saw large parts of the city including police headquarters and the governor's compound under siege at different times, caused shock among residents. "The Taliban are moving very fast, if the government does not take serious and speedy action, the province is going to collapse to Taliban," said Hamidullah, a resident of the city reached by telephone in the morning. The attack adds to the problems facing President Ashraf Ghani's government, which has come under increasing public pressure over worsening security ahead of parliamentary elections due in October. There were no detailed casualty assessments but a Resolute Support spokesman said dozens of Taliban fighters had been killed and there had also been an unspecified number of casualties on the government side. Farah province, a remote and sparsely populated area, has seen months of heavy fighting, with hundreds of police and soldiers killed and severe losses inflicted even on elite special forces units. Residents have warned repeatedly that the provincial capital was under threat. "Farah is in dire need of air support," Dadullah Qane, a provincial council member, said by telephone as the fighting went on in the morning. "The Taliban are well equipped with heavy arms and night vision equipment." Tuesday's assault adds to the growing number of crisis points around Afghanistan since the Taliban began their annual spring offensive last month, including a series of deadly suicide attacks in the capital, Kabul. Although the insurgents have been unable to take and hold any provincial center, they are active across Afghanistan and the government has firm control over no more than 56 percent of the country, according to U.S. estimates. Farah, which also borders the opium-rich Taliban heartland of Helmand province, has key smuggling routes into Iran. Hundreds of fighters have moved there as U.S. and Afghan forces have stepped up operations in Helmand. As the fighting raged on Tuesday, Taliban spokesman Qari Yousuf Ahmadi warned civilians to remain in their houses. Residents said shops, schools and government offices were closed and the Taliban had set up posts around the city and were checking identity cards and preventing people from fleeing.